If there’s a Hanukkah equivalent of the Grinch, they’re probably relieved that last night, Wednesday, December 8th, was the final night of Hanukkah and the final night of Yo La Tengo Hanukkah shows. Those in attendance last night were treated to an opening set by a local band called The National and comedian Marc Maron. Frequent YLT collaborators Bruce Bennett (of the A-Bones) and Gil Divine were special guests during the encore, and Hamish Kilgour of the Clean sat in most of the night on guitar. 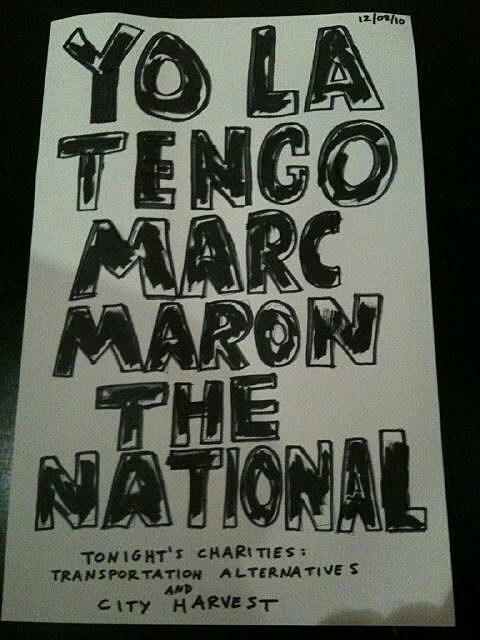 The National and Marc Maron opened. benefit for Transportation Alternatives and City Harvest. Mix disc by Joe Puleo.